It’s that time of the year again when love fills the air and people turn into the most romantic versions of themselves. From V-Day cards and cuddly teddy bears to blooming roses and heart-shaped cakes, everyone who has someone to celebrate the love month is surely trying to come up with ways to surprise the apple of their eye. If you want to make your Valentine’s dinner more special, don’t just stop at cooking a hearty meal for two. Play up your next moves with an exquisite presentation of the food you’ve prepared so lovingly. Wonderland’s a bite away with this delicious, easy-to-make Queen of Tomato Tarts. Puff pastry, mustard, and thick heart-shaped tomato slices are all the ingredients you need to make these lovely tarts. Cut the pastries into little hearts, with a smaller cutout in the middle. 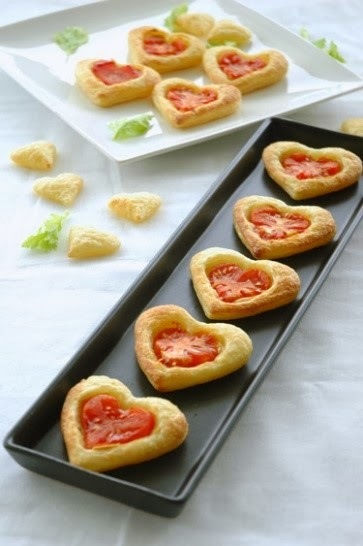 Spread the inside with a bit of mustard, place the heart-shaped tomato slices on the center of the pastries, put the tarts in the oven, and wait for them to bake into golden brown hearts. Best served warm and shared. Figure 2 Who says roses should only be made of petals? 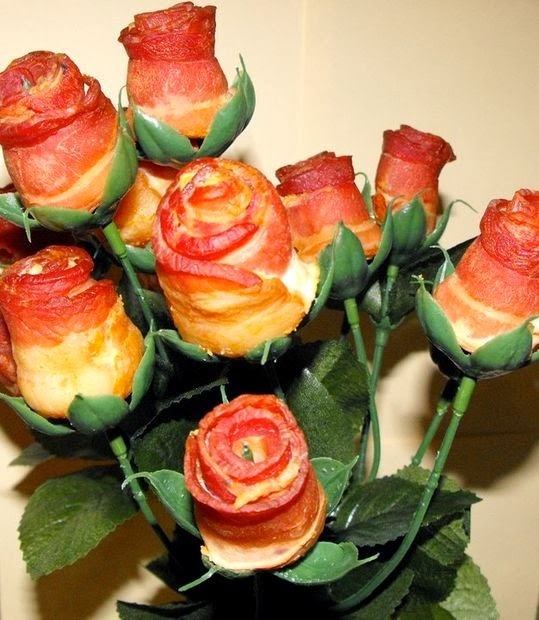 If you want to put a unique (and yummy) twist to the traditional Valentine’s bouquet of roses, why not give your loved one a bouquet of bacons instead? It’s a sure feast to the eyes, and fill to your belly! To do this, you’ll need a mini muffin pan drilled with holes at the bottom, a broiler pan, plastic rose stems, a glass vase, and two packs of bacon (regular and thick pack). Tightly roll the bacon strips into roses and place them on the muffin pan one by one. Make sure there are holes at the bottom of the pan to drain the bacon oil as it cooks for about 30 to 40 minutes. While you’re waiting for your bacon buds to get cooked to a golden crisp, start preparing the rose stems. Remove the plastic roses but attach the green plastic leaves back to the stems. Once the bacon buds are cooked, attach them to the stems and place your freshly cooked bouquet in a glass vase. Your bacon bouquet or second round of appetizer can double as a tasty centerpiece too! 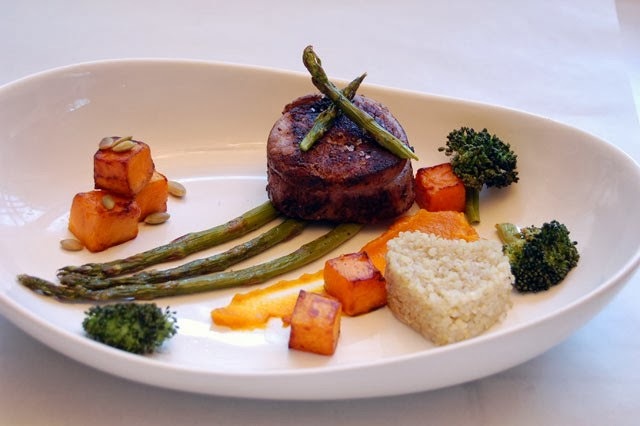 You’d probably need the help of a food plating expert for this meal. Go all the way with the presentation of this main course. will feel like you're dining in a posh restaurant. For this meal, you’ll need a slice of steak, asparagus, quinoa, squash, and a bit of broccoli. Fill a heart-shaped cookie cutter with quinoa and press it down, so it will hold its shape. Next, roast and puree sliced squash. For the puree, you just add a bit of butter and some chicken stock, then blend with a stick blender. To achieve a nice stripe on the plate, drop a tablespoon of puree and slide the back of your spoon on it. For the finishing touch, peel the remaining squash and cut it into cubes. Pan sear in a mixture of olive oil and butter until thoroughly cooked. Watch your date sink his teeth into some serious strips. 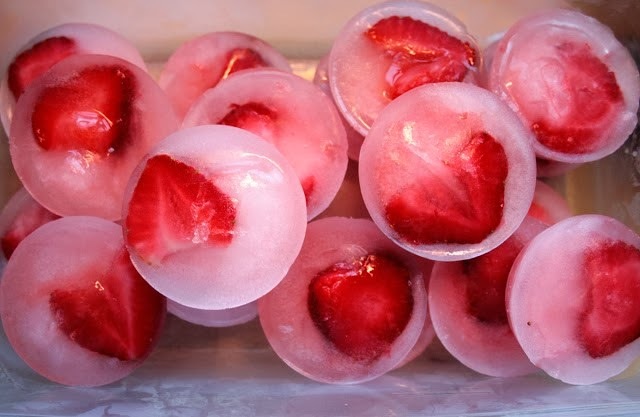 frozen in pink ice cubes to your special someone. After finishing off a satisfying Valentine’s dinner, surprise your special someone with a heart-filled (literally) strawberry kiss that’s sure to freeze his toes. This romantic little darling’s pretty easy to make. You can use a muffin tin tray (like the one you used for the bacon bouquet) or any other ice cube container with cute shapes; leave the boring square ones in the cupboard for today. Cut the strawberries into tiny hearts, place them one by one into the tray, and fill up the tin with pink lemonade. Wait until the cubes are frozen before adding them to your punch. And there you have it—a sweet love punch to cap your memorable night. Know any other creative Valentine’s Day food presentations or food plating ideas you’d like to share? Recipe management software CALCMENU offers a Plating Instructions feature where chefs and culinary experts can add instructions for creating food presentations. This feature is most useful for restaurants, catering and events, and most importantly as a training aid for amateur chefs. You can use this as a reference of professionally plated dishes. Snuggle up and share your thoughts in the comments section below. Happy Valentine’s Day!